I can’t believe I have already been on an Insulin Pump for 4 years which means my current pumps warranty is up for renewal and at the moment I use an Animas 2020 pump which has been great. So I am currently using the New Animas Vibe and hope my blog shares some information that you may find useful. the-art Dexcom G4 Sensing technology with high-performance Animas pumping. That means it gives you the features Animas® pumps are known for, like waterproof durability¥, fine-tuned dosing and a high-contrast, self-illuminating colour display. It’s also designed to streamline the whole CGM experience for you, while giving you a full-colour view of how your glucose is behaving. Animas Vibe is designed to give you a more complete picture of your glucose*. In addition, its packed with a unique combination of features designed to help you perform at your best. I didn’t realise that the pump needed to be replaced after 4 years and was a little worried that it may not be funded again but my hospital at High Wycombe are very good and sorted everything out for me very easily. I had been speaking with Caroline and Jill from Animas about renewing my Animas 2020 pump and that I would like to try the Animas Vibe with CGM which they arranged for me. My day started at High Wycombe Diabetes Centre with Caroline, Jill and Una (DSN) on Monday 30th January 2012, as you can imagine I was very excited indeed. My old pump was really difficult to read the screen which had put me off the Animas pump but what I discovered was that the screen on my old pump had burnt out so needed replacing (That was a relief and of course Animas said they would replace it). 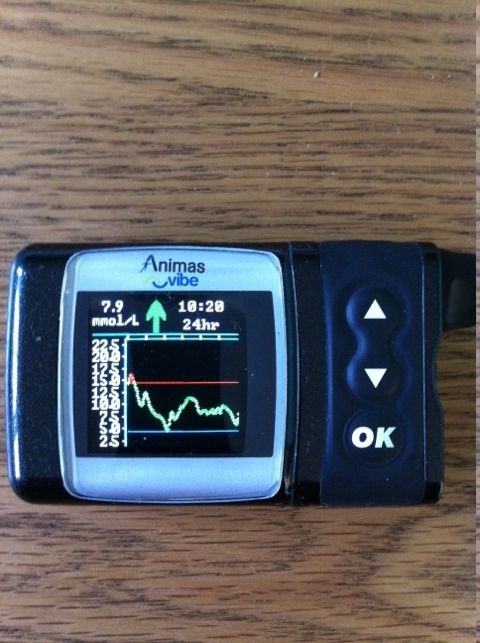 We went through the functions of the new Animas Vibe pump which is pretty much the same as the Animas 2020 apart from the fact it has CGM so I already had a head start, I love how easy the Vibe is to use and the fact you have a nice clear colour screen especially when looking at the CGM trend graph as pictured above. The team at Animas and Una were really great and went through everything with me especially on how to use the CGM and inserting it, I am just so frustrated that I can’t get funding from the PCT for CGM. The actual insertion of the sensor is very easy and didn’t really hurt at all but more of a scratch which I was pleasantly surprised with, the sensors are recommended to be placed on your tummy and not on your back which makes it easier to insert. I did however have an issue with the first sensor which must have hit a blood vessel as a couple of hours later the CGM alarmed to say it was not working, I spoke to Animas who said to change the sensor as when I was with them it looked as though it had possibly hit a small blood vessel. 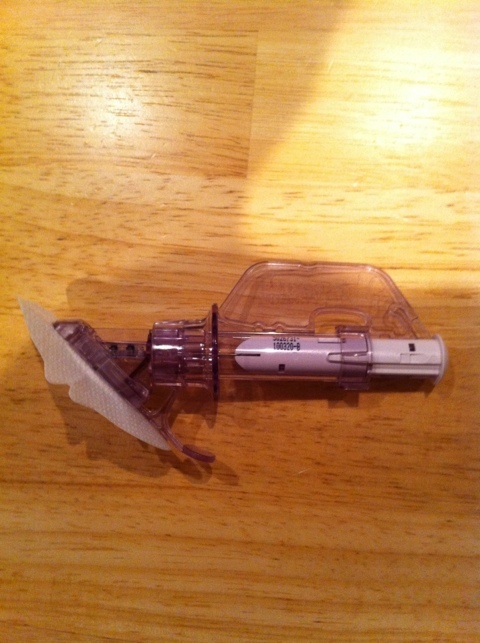 The setting up of the CGM was very easy once the sensor had been inserted and I actually managed easily on my own. The sensor last for 7 days and alarms to let you know once the 7 days has finished, I like the fact you can wear it for 7 days without changing. The second sensor I used went in perfectly and I had no problems at all and again was like a sharp scratch so no pain really. In regards to the results given by the CGM please remember that the CGM is really to be used to give trends rather than exact blood glucose readings, at the end of the day pricking your finger is still the most accurate. My results compared to finger prick testing were out by quite a way to be honest (not all the time though) but I had been suffering with a nasty chest infection for over a week then travelled to Sweden for a few days, this probably didn’t help with the results so I do hope I get another chance to test the CGM now I am well – we shall see. I have one sensor left as of today Monday 27th Feb and plan to use this after my next Diabetes check up and I will then have used my months trial and can upload my results for my DSN. So would I use CGM if it was funded by the PCT – yes most definately as it made me feel a lot less worried whilst travelling knowing it would alarm if my BG level was too low. I hope this helps and hopefully I will get the chance to try some more sensors while I am feeling well but watch this space. Please email or comment if you have any questions at all. Thanks for the update, Andrew! Appreciate the perspective and hearing about your experience. I did not know that the Vibe had already been approved! My 4-year warranty is soon up as well and i would love to upgrade from my Ping to the Vibe. Thanks for sharing great to know! I am currently using a Medtronic pump. The features of the Animas Vibe being waterproof & mac compatible have made my decision to switch over to the Animas Vibe a lot easier for me. The cartridges hold approx 200 units but once you have primed the pump you are left with about 190 units which should last a maximum of 3 days. I hope that helps but please ask if you have any other questions? Anyone know when they are coming out with this in the US? Jess – 190 units last 3 days???? That would last me 7-8 days. Hy thanks for this, I add my Vibe and Dexcom the 3 April so i wait . In France like i think in USA you need to paid the G4 sensor 250€ without taxe for 4 with 1 transmetter taxe is 7.7% . Some people in hospital use the G4 sensor two week and one test and puch to 40 days with one sensor . For unit Lindy nobody have the same insuline schem, activity body etc. I use 19.9u basal for one days and 10/12 unit when i eat so 50 unit for one days … 3/4 days ( 1.80m and 70kg ) for me it’s very good for change my catheter because i don’t remember and go to hyper .